Are you still waiting for your vacations and haven’t made a decision where to go? The little resort town based on the coast of Costa Del Sol could be the perfect option! Nerja is a little town based in the province of Malaga, in the south part of Andalusia, Spain. The town has only a little bit over 20 000 inhabitants, however, each year Nerja receives a mind blowing amount of tourists which exceeds 180 000 visitors not counting those who are coming just for a day. The numbers say a lot! Nerja is so loved by tourists that many of them consider Nerja as the most beautiful town of Malaga. The paradise with blue water beaches, little streets, squares with the terraces and very warm atmosphere. Balcon de Europa or in English Balcony of Europe is the most famous place of Nerja. It is rocky cliff location provides stunning views of the Coast line from both sides. Don’t forget to take a photo standing in the middle of the balcony or a photo with King Alfonso XII who made this place famous. Balcon de Europa is also concerts and celebration area. At night many artists, musicians offer various performances making Balcon de Europa attractive during the night time as well. There are a lot of bars, cafeterias, restaurants and ice cream shops around. Grab your favorite glass of wine or your favorite ice-cream sit at a terrace and enjoy an amazing long lasting evening. The Cave of Nerja, La Cueva de Nerja in Spanish, is one of the most visited natural objects of Spain. It is situated nearly 160 meters above the sea level. The six paintings of seals are the only known artistic images created Neanderthal man. The caves are unique and different from any other in the world due to its world record breaking paintings of seals. These artistic images are considered to be between 42,300 and 43,500 years old and are believed to be left by Neanderthal man. This makes the painting to be the oldest art works in the world found so far. In addition to this, in the Nerja caves, you can also see the world’s largest column which is formed by a stalagmite and a stalactite. It is 32 meter in height and 13 meters by 7 meters at its base. Also, if you are in Nerja in July you just cannot miss this unique opportunity to participate in the annual festival of the music and dance Festival de Música y Danza which is held just inside the cave! If you do not have a car just grab a bus or a special train which will leave you just outside the entrance to the caves. Eagle Aqueduct (Acueducto del Aguila) also known as Eagle Bridge (Puente del Aguila) is situated just outside the center of Nerja on the way to the Caves of Nerja. The Aqueduct which was build in the 19th century now it is considered as a great example of the Spanish historic architecture. An interesting fact is that the Aqueduct is still used by local farmers however you can stop and view it from a road side lay by, take photos and enjoy this magnificent human creation. Nerja has many and very different beaches to offer. In total Nerja has 12 beautiful beaches to offer which will definitely fit everyone’s expectations. If you don’t have a car or moving around is something that you would like to avoid than Burriana beach is a perfect place! Here you will have everything that you need, restaurants, cafeterias, shops, access to different water sports, lifeguards and much more. As a result, this beach is probably the most popular among the tourists. However, be aware that to get to this beach from the center of Nerja also, could be challenging. We would recommend grabbing a taxi especially on the way back. If you are looking for some place to relax Carabeo beach could be a great choice. It is a small beach situated just next to the Balcon de Europe, in the heart of Nerja. The beach is surrounded by cliffs and is only accessible by taking the steep stairs from Calle Carbeo. Be aware and prepared since the beach is small there are no chirinquitos. Hence, to have some snacks and water with you would be a good decision. Those who would like to completely escape and see the beauty of Costa del Sol, we would recommend to head towards Maro. Just a few kilometers away from city center of Nerja you will find the beach of Maro (Playa de Maro), Las Calas del Pino beach and Las Caleta de Maro Beach. Crystal clear waters, great snorkeling experience, never crowded beaches, hidden waterfalls and underwater caves will for sure impress you. If you are bored and tired of lying at the beach we have another great suggestion for you. What about going hiking for a day? It might sound crazy especially in the middle of the summer when the temperature hits nearly 40 degrees. However, trust us you will feel blessed! To get to the river from the center of Nerja can take up to one hour and the way up will take 2 hours. Thus, be sure to start climbing early so that you have enough time to enjoy the natural swimming pools, take some photos and make some small stops once in a while. The path includes walking in the water and on the stones thus make sure that you have adequate footwear. Some old trainers with a thick sole or some water shoes would be a perfect choice. 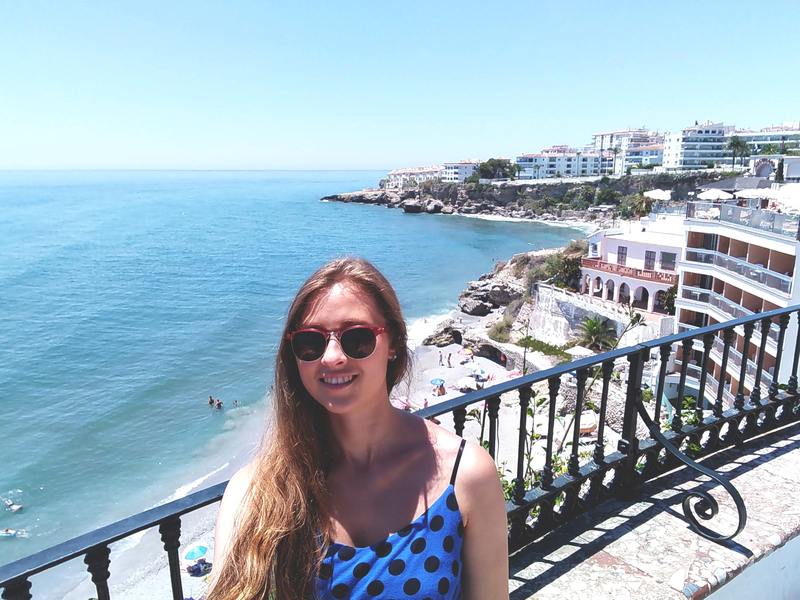 Impressed by Nerja? Book your upcoming holidays and experience the treasures of Nerja by yourself!